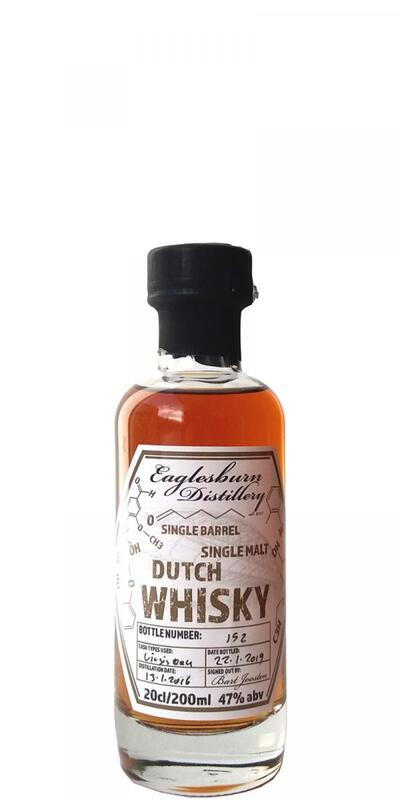 Bart Joosten of the Dutch Eaglesburn distillery has just released his new single malt, again in bottles of 20cl. This time the whisky was distilled on 13th January 2016 and bottled on 22nd January 2019, but – contrary to the previous release – unpeated. This is a single barrel. Bart is doing very well. He just won ‘Best Vodka in the World’ with his JAV (Just Another Vodka) according to the Spirits Business London. Go figure! Anyway, I prefer whisky, so let’s give this one a go. Yes, lovely fruity nose with notes of brown bread, a truckload of nuts and chocolate, dark spices like cinnamon and nutmeg, candied orange peel, plums and pastry. Some wood and sniffing tobacco. And – please don’t laugh – a touch of dried cola! Amusing. Good body! Lovely spiciness from the first sip with a wonderful sweetness as presented on the nose, balanced with touches of wood. Mandarin, pineapple, plums… all of that in a spicy fruit salad. The virgin oak did its job, without dominating the spirit. Nice. A trace of woodsmoke gives it some depth. I am a fan! The finish is dark and sweet, warm and long. Bart, what is your secret? This is classy! Love the fact that there are some similarities already between the Peated 2015 and the unpeated 2016, shows of the character of Eaglesburn. And that's a character to like! After having tasted Eaglesburn's surprisingly good peaty first born, it's time to taste the distilleries 2nd offspring. Let's see if this one can match up with the high standard, owner and distiller Bart Joosten has started off with on his whisky trail. Bart has already won several prices with his Gin, Vodka and Rum, so he must do something right out there. This 2nd batch Eaglesburn whisky was distilled on 13 januari 2016 and was bottled on 22 januari 2019. Because of the low distillery output, only 20cl bottles are available. This 50 liter batch was matured on virgin American oak barrel and comes at 47%. First nosing didn't show me any of that 47% though. A buttery cereal and a nice sweet chocolate orange were present but all in a supporting role. The main character of this play was for the young wood. I got an instant flashback to my childhood. I saw myself as a young kid, diving in piles of woodshavings at my grandfather's wood workshop. Wow wat a nice surprise that was. Never experienced that much 'wood workshop' in a dram. A nice waxy mouthfeel with a decent amount of wood spice accompanied by some fresh vanilla apple. Wow! Alcohol again, was nicely hidden in the background. The virgin wood didn't hide itself but showed it's glorious beauty again at this point. At the medium/long spicy finish the alcohol again was nicely hidden, but a nice gingery/pepper gave this beauty quite some lingering bite. What a very nice high quality youngster by Eaglesburn again. This 3 year old stuff only makes you wonder what some extra barrel years would do with the distilleries high quality spirit. Good job with this 2nd batch Eaglesburn!